New York City, Banksy is back in the five boroughs with an entirely new repertoire. 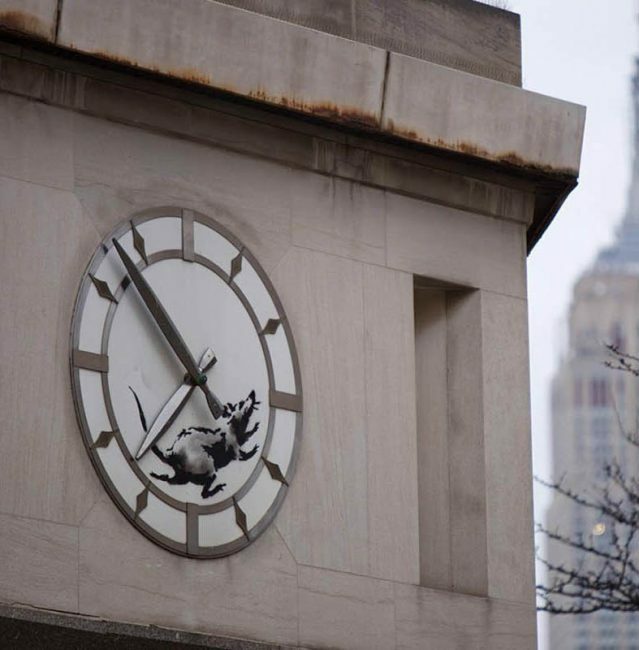 Starting off small with the image of a rat running inside the face of a clock of a closed down bank in Chelsea, it was his second addition to the city that really caught everyone’s eye and Instagram. Placed on a wall over the Houston Bowery which was made famous by Keith Haring in the 1980s and that has since housed works by Os Games and JR among many others is the 70-foot political mural. Denouncing the imprisonment of Turkish journalist Zehra Doğan over her watercolor of the destruction of the Kurdish town of Nusaybin. In regards to the relatively simple work he says “I’ve painted things much more worthy of a custodial sentence, but I really feel for her” and in classic Banksy style there is always another layer to his work. Not only does one of the metal bars from which the journalist can be seen peering out of double as a symbolic pencil, but the number of black marks representing jail cell bars are also the number of days she has spent in prison at the time of the mural’s creation. As Banksy continues to make his way through town his notoriety keeps rising, and with more works being discovered on a seemingly daily basis Banksy fans can be seen scouring the city in search of the latest symbolism filled-work. 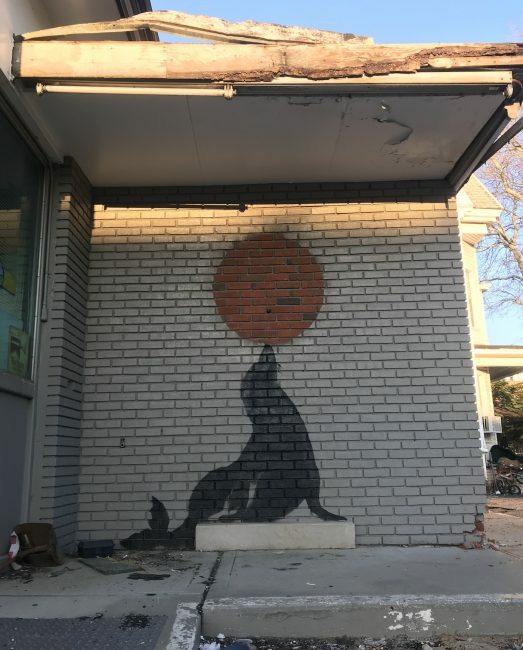 While some of the pieces have left people wondering if Banksy really is the author – see the seal balancing an empty circle on its nose – others offer a typical Banksyian commentary on social issues. 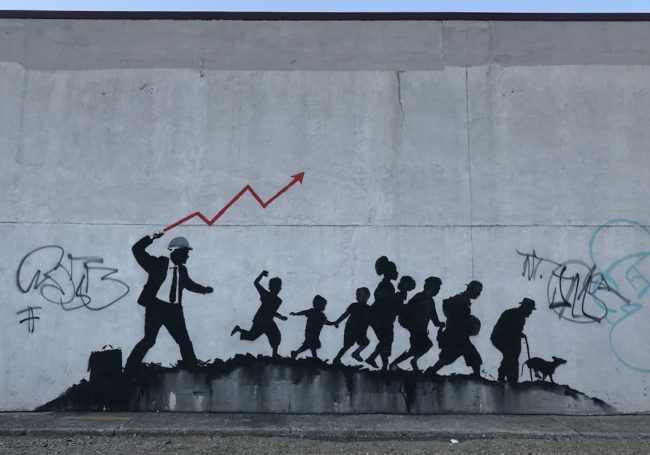 Complementing the seal, a larger mural sits across the abandoned gas station lot in Midwood, Brooklyn, depicting a presumed real estate developer cracking a whip over a group of people from all walks of life; with the whip mimicking a line graph the denouncement of gentrification and housing redevelopment is obvious. One of the few street artists to successfully and consistently sell at auction, he has developed a cult following that keeps growing along with his vast array of works. Working not only in outdoor spaces the man without a face has been producing sculptures, prints and canvas paintings on a variety of topics, from his more political themes to odes to artists who have come before him, such as Keith Haring and Andy Warhol. 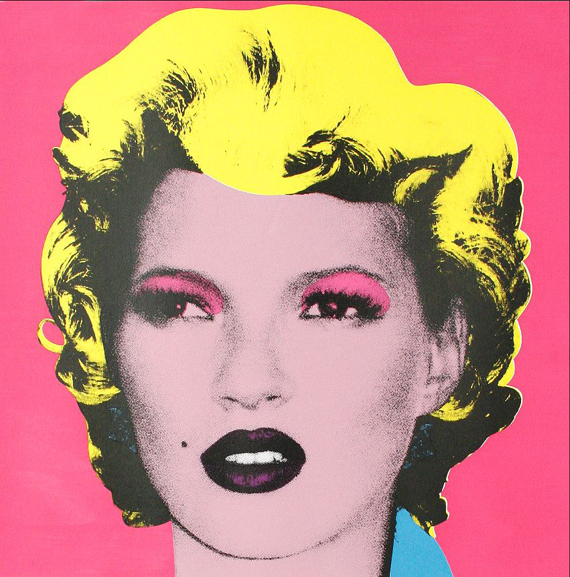 Guy Hepner is pleased to present a selection of prints and original Banksy painting. Inquire today on availability and pricing.